رحمانی, مرتضی, خجسته, فاطمه, روشندل کاهو, امین. (1393). بهبود توان تفکیک طیف سرعت با استفاده از روش شباهت وزنی. مجله ژئوفیزیک ایران, 8(3), -. مرتضی رحمانی; فاطمه خجسته; امین روشندل کاهو. "بهبود توان تفکیک طیف سرعت با استفاده از روش شباهت وزنی". مجله ژئوفیزیک ایران, 8, 3, 1393, -. رحمانی, مرتضی, خجسته, فاطمه, روشندل کاهو, امین. (1393). 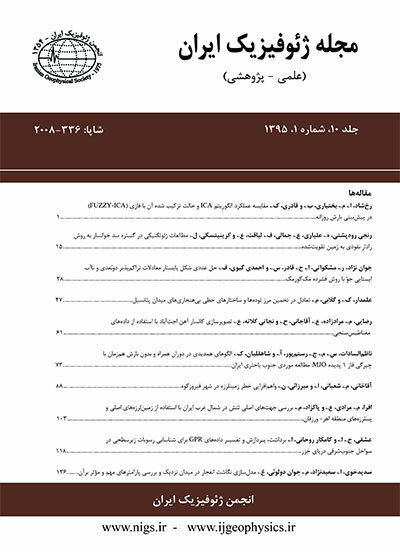 'بهبود توان تفکیک طیف سرعت با استفاده از روش شباهت وزنی', مجله ژئوفیزیک ایران, 8(3), pp. -. رحمانی, مرتضی, خجسته, فاطمه, روشندل کاهو, امین. بهبود توان تفکیک طیف سرعت با استفاده از روش شباهت وزنی. مجله ژئوفیزیک ایران, 1393; 8(3): -. از مهم‌ترین مراحل پردازش داده‌های لرزه‌ای بازتابی، تحلیل سرعت است که سرعت مناسب برای تصحیح برون‌راند نرمال و برانبارش را برای بازتابنده‌ها، برآورد می‌کند. یکی از روش‌های مرسوم تحلیل سرعت، محاسبه شباهت است. عوامل گوناگونی از جمله گسترش دوراُفت، نسبت سیگنال به نوفه، طول پنجره و مانند آن روی توان تفکیک طیف سرعت و پهن‌شدگی آن تاثیرگذار است. افزایش تفکیک در محاسبه شباهت سبب می‌شود که دقت برآورد سرعت تصحیح برون‌راند نرمال و برانبارش بهبود یابد و همچنین می‌توان رویدادهای بازتابی را که از نظر سرعت ‌و زمان دوطرفه به یکدیگر نزدیک هستند از یکدیگر تفکیک کرد. کیفیت طیف سرعت به حساسیت محاسبه شباهت به تغییرات سرعت، بستگی دارد. با محاسبه عبارات وزنی که به تغییرات سرعت حساس‌تر هستند، می‌توان کیفیت طیف سرعت شباهت را افزایش داد. پیاده‌سازی روش وزنی رابطه مستقیمی با بسط تیلور شباهت دارد. می‌توان میزان شباهت را با استفاده از کمینه کردن تابع وزنی آن افزایش داد. در مقایسه، شباهت وزنی بهتر می‌تواند قله‌های شباهت را برای تشخیص رویدادهای تداخلی متمایز کند. کارایی روش شباهت وزنی با اِعمال بر داده‌های لرزه‌ای مصنوعی و واقعی بررسی شده و نتایج آن با روش شباهت متداول مورد مقایسه قرار گرفته است. نتایج به‌دست آمده بیانگر آن است که روش شباهت وزنی نسبت به روش شباهت متداول دارای توان تفکیک بیشتری است. Velocity analysis is one of the most important steps of seismic reflection data processing which estimates the appropriate velocity for stacking and normal moveout correction. Taner and Koehler (1969) introduced the conventional semblance method for velocity analysis which is a normalized coherency measure. Semblance-based velocity analysis generates a velocity spectra for a common midpoint gather. Various parameters such as offset, signal to noise ratio, window length and etc. influence the resolution of semblance velocity spectra. Â Â Â For velocity analysis of a single reflector, if we consider the true velocity, then the hyperbolic reflection event aligns to the horizontal event in an analysis window and computed value of semblance is equal to one. If the operator selects an incorrect velocity, the hyperbolic event does not align to the horizontal event and the semblance value is reduced. If the selected velocity is close to the true value, then the computed semblance has a value close to one. Therefore, the resolution of the velocity spectra is reduced. Â Â Â Various methods have been introduced to improve the resolution of the semblance velocity spectra. Biondi and Kostov (1989) used the eigenstructure method to increase the resolution of velocity spectra. Sachi (1998) obtained the high resolution velocity spectra using the bootstrap algorithm. Roshandel et al (1387) improved the resolution of velocity spectra by multiplying the ratio of the two first eigen values of analysis window and the semblance value. Â Â Â In this study, we used the weighted semblance value introduced by Luo and Hale (2012) to obtain the high resolution velocity spectra. In this method, the weight functions are added to the semblance equation. The weight functions make the semblance value more sensitive to velocity and increase the resolution of the velocity spectra. Therefore, the weight functions must be calculated in a way that it is sensitive to the temporal change in normal moveout correction for every velocity at every offset. Â Â Â To illustrate the efficiency of the weighting function on the resolution of semblance spectra, weighted semblance and conventional semblance implemented on both synthetic and real CMP gathers. In the first synthetic example, we generated a CMP gather for a 37-layered earth model with linearly increased velocity. We computed its velocity spectra by both conventional and weighted semblance methods. Then, we added random noise to the synthetic CMP gather and re-calculated the velocity spectra. In these two synthetic examples, we have observed that the weighted semblance had a better resolution than conventional form. In the next step, we added multiple to CMP gather with near velocity to the primary event. Comparing the velocity spectra obtained from two mentioned methods showed that the conventional semblance cannot completely distinguish between the primary and multiple velocities. But they were easily separated from each other in velocity spectra of weighted semblance. Finally, both methods were applied to real data relating to the South West of Iran. The obtained result showed that extension of peak in the velocity spectra in the weighted semblance decreased. Thus, we can say the weighted semblance method has a better resolution than that of conventional methods.